The UK footballing season hit a summit of tension during last Monday’s game between Manchester United and Aston Villa, with Premier League supporters holding their breath as United secured the three points required to reclaim the title as 2013 champions. 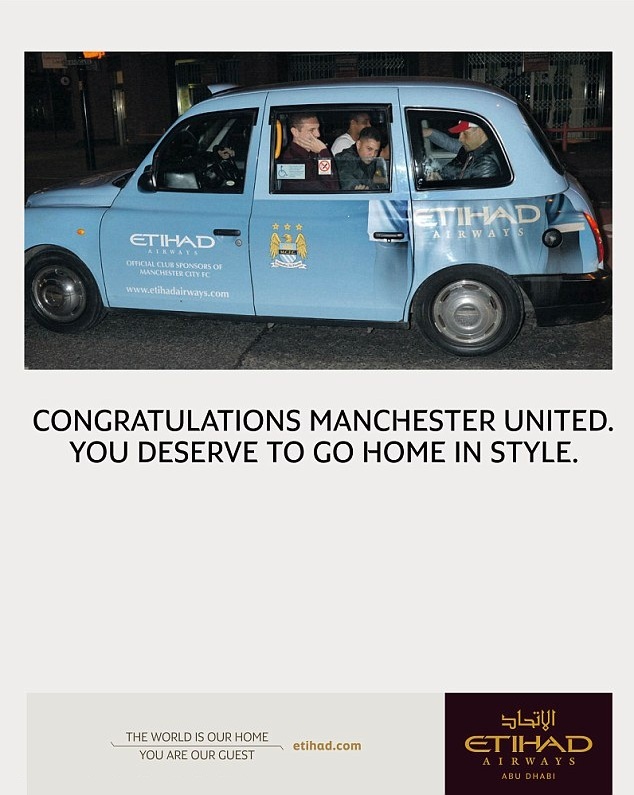 With city-centre celebrations lasting into the early hours, Manchester United were greeted with a backhanded congratulations from their rivals over at the Etihad Stadium, as Manchester City published a mischievous advert in the Manchester Evening News paper which depicted the United team crammed into a taxi drenched entirely in City’s sponsor Etihad Airways. Out of a sea of black cabs, this Etihad-branded variety clearly displays the text ‘official sponsors of Manchester City FC’. Serbian centre-back Nemanja Vidic and his counterpart Rio Ferdinand can both be seen in the vehicle, and further photographs snapped individual players in the taxi’s interior. Having worked with Transport Media to create a fleet of golden branded vehicles earlier this year, Etihad Airways are familiar with the coverage which can be generated from taxi livery campaigns.